France’s favorite three-piece chiptune pioneers DATpolitics have bounced around clubs and festivals around the world with the likes of Kraftwerk, Architecture in Helsinki, YACHT, and Jagga Jazzist. Initially conceived as a production team when its members created the art platform Skipp, a label and graphic design project, the laptop trio have since carved out a distinctively eccentric, but unique presence in the realm of electronic art-pop. 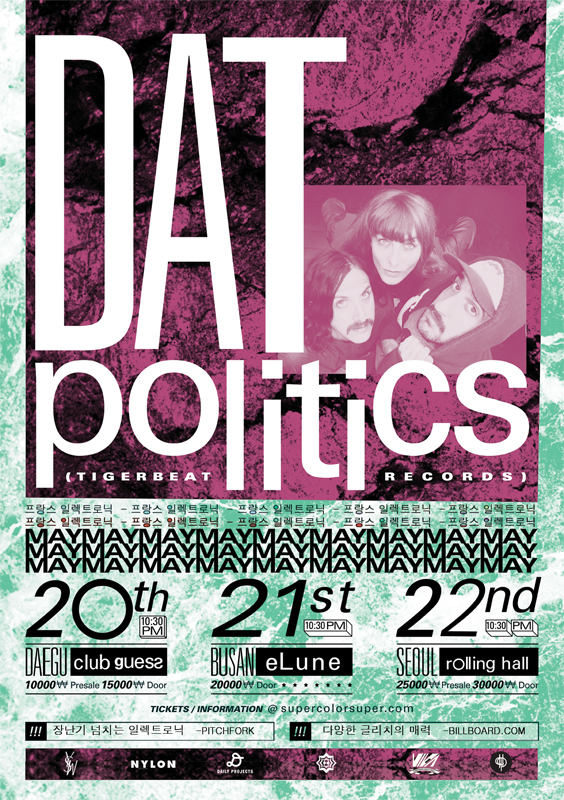 DATpolitics are known for their prolific work which has seen them release eight studio albums including their latest, Mad Kit, via record label Chicks on Speed. The group’s signature sound of highly catchy e-pop hooks helped them secure a spot on “The Itunes Essentials” compilation which included tracks by artists at the forefront of France’s electro movement including heavyweights Daft Punk, Justice and Busy P. The group has also received several honorific mentions at ARS Electronica; a festival celebrating art and technology and Europe’s foremost competition in the cyberarts. DATpolitics’ latest release, Mad Kit, delivers a sustained high-energy blast of bubblegum glitch-pop that is shamelessly synthetic but vivid, vital and exhilarating. The straight beat propulsion gloriously hits audienes with catchy, melodic and eminently danceable tunes. The surreal electronic wonderland that is Mad Kit is heavily pixellated with pop exuberance highlighted tracks like the joyous laptop-crunching melodicism of ‘Bad Dream Machine’ which sets an early benchmark, sounding frivolous and more than faintly ridiculous, but never resorting to kitsch or slapstick tendencies. Sonically-delving deeper, ‘Wish Ya’ intentionally dabbles with hipster electro-house and bitstreams the highly stylistic fad. The album slots nicely into the comparatively sensible techno-centric pop song and AM/FM mix of ‘Step Back’ which seems to further organize the unruly, DSP-munching Datpolitics sound. The album is an express shot of playful, booty- shaking synth-pop ripe with digitalized vocals, distorted breaks and electric frequencies hyperactive but altogether structurally complex, quirky, and sharpened to an expert taste of absurdly infectious fun. 프 랑스가 총애하는 칩튠 개척자 트리오 DATpolitics는 Kraftwerk, Architecture in Helsinki, YACHT, and Jaga Jazzist 같은 팀들과 함께 전 세계 각국의 클럽과 페스티벌을 누비며 활동 하고있다. 초창기에 멤버들은 프로덕션 팀으로써 활동해왔고, 아트 일렉트로 팝을 기점으로 Skipp 이라는 이름의 아트플랫폼레이블을 창시하여, 음악활동과 아트 그래픽디자인 활동을 했다. 2000년 데뷔 이래로 Chicks on Speed 레이블에서 나온 최근 앨범 Mad Kit까지 8장의 스튜디오 앨범을 냈을 정도로 끊임없는 창작활동으로 알려져 있다. 기억에 남는 일렉트로 팝 시그너쳐 사운드는 DATpolitics가 Daft Punk, Justice, Busy P와 같은 굵직굵직한 그룹들과 어깨를 나란히 하고 “아이튠즈 필청”컴필레이션에 수록되도록 해줬다. 또한 ARS Electronica를 통해 “페스티벌의 아트 셀러브리티, 유럽 최고의 싸이버아티스트” 라는 찬사도 받아 왔다. 최근작 Mad Kit에서는 파워풀한 에너지를 유지하는 글리치팝으로 복합적이지만 뚜렷한 색을 지녔다고 아낌없이 말할 수 있는 쾌활함과 생동감을 보여준다. 끊임없는 비트추진력, 멜로디와 빼어난 댄스튠으로 청중을 휘어잡는다. Mad Kit에서 펼쳐지는 일렉트로닉 신세계는 환의에 찬 다채로운 아트팝 향연으로 수놓아진 트랙들로 점정 된다. 수록곡 ‘Bad Dream Machine’의 부서지는 멜로디는 장난스럽고 믿을수없이 혼미하기도 하지만 키치나 익살과는 거리가 멀다. 강렬한 사운드의 ‘Wish Ya’는 힙스터 일렉트로 사운드와 현란한 유행 스타일의 비트를 따른다. 또한 앨범을 통해 테크노센트릭팝과 어디로 달려갈지 알 수 없는 ‘Step Back’의 AM/FM믹스, DATpolitics사운드의 향연을 맛볼 수 있다. Mad Kit은 가히 장난스럽고 몸을 흔들게 하는 신스팝과 디지털 보컬링, 뒤틀린 브레이크비트와 일렉트로 프리퀀스로 정신 없이 뛰노는 듯 하면서도 음악적 구성으로 볼 때 다양하고 가변적인, 음악 애호가들도 중독성을 느낄 만 한 그런 마력을 지니고 있다. ***Tickets also on sale at Hyang Records (Shinchon), Daily Projects(Chungdam), and Club Bowie (Hongdae)!/ 온라인 예매 외에도 향레코드, 데일리 프로젝트, 클럽 보위에서 티켓 구매 가능합니다!